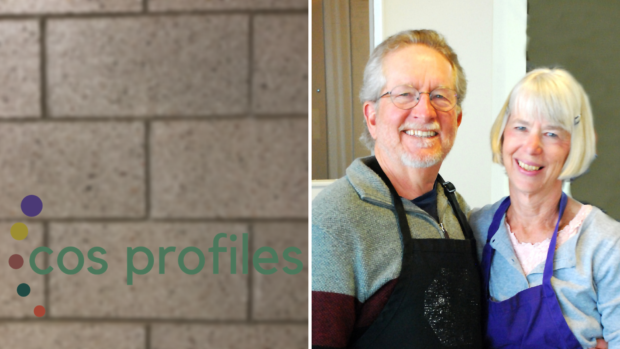 This month’s profile features Paul and Jan Stoub. Interviewer: Paul, you have been most visible here at church through your art work. What are some of the things you have done for COS? Paul: The most recent thing was the portraits for the covers of the church liturgies during the last liturgical year. Then last December, we had a show of that art work and people seemed enthusiastic about it. It gave me a chance to focus on the scripture reading for the sermon each Sunday and forced me to produce some art work each week. Interviewer: It must have given you a lot of insight into some of those passages. Paul: It’s been a life long journey for me to illustrate biblical passages, so it wasn’t anything new. But to focus on the biblical characters and to try to bring them to life was an interesting project. Interviewer: Did you do the wood cut that is in the entrance way to the church? Paul: It’s based on the wood cut that is handed out to every member called Children of the Light. But that carving was done by Mike Vander Wall. Interviewer: You did the original wood cut, right? Is there a story behind it? Paul: It was such a long time ago! It was 1974. The church had just been formed. But I can’t remember whether it was a request or if I just did it. I made the wood cut thinking of the church. I made about 75 prints of it. We gave one to everybody in the original group. Then as more people began to join, we thought, “Let’s make this a membership gift.” So that tradition has continued. Thousands of prints have been passed out. After those first 75 or so they have all been printed commercially and not pulled off the original wood cut block. Jan: Where is that wood cut block? Paul: The original wood block is in our basement. Interviewer: Are there other artistic things you have done around the church? Paul: The tiles at the entrance of the church – the little frieze done in ceramic tile. It gives a simple description of the liturgical year with the names of the different seasons and some biblical scenes from each of those seasons. Interviewer: That’s not a medium you usually work in, is it? Paul: No. I worked with my sister, Mary Kuilema, to produce those. She’s a ceramic tile artist. Interviewer: Art work is not the only thing that you two have done here at the church. You have contributed a lot. I know you have been involved in the food pantries. Can you tell us about that? Jan: We help organize the inside pantry. Mostly we inventory it regularly and stock shelves so that Ellen knows what to buy. We also watch to see when items expire and what people are actually using so that we don’t buy things they don’t want. We don’t meet with the people since they come in during the day. We also do the mobile food pantry that’s over at Camelot Woods. That’s on the first Saturday every month. Interviewer: And you are part of that every time? Jan: That’s right – when we are in town. We take the food off the Feeding America truck and quickly count it. Say we have 1000 apples and are expecting 100 people. So, everyone gets 10 apples. Sometimes we have to bag the produce. The apples might come in a big bin. And then we just hand it out. We get there about 9:15 and we are done by 11. We see many of the same people pretty regularly. The volunteers are pretty regular too, but we have had a few new ones lately and that has been very helpful. It takes about 15 volunteers each time. Paul: The biggest volunteer need is the kitchen where we also volunteer. Interviewer: Tell me more about that. Paul: The church provides a lot of meals for various events, for the Wednesday night church dinners, for funerals, for various conferences and social events, for young people and college students. Interviewer: Also, the once-a-month congregational dinner. Jan: And the CORR conferences. This weekend we prepared meals for the trauma awareness support group. Interviewer: So, there is really a tremendous amount of food prep. Ellen does most of that, doesn’t she? Jan: Ellen and whatever volunteers are available. There is a core group of a half dozen or so. But they are not always available. And there is always cleanup after the meals. Interviewer: It sounds like you could use some more help. Paul: Yes, extra volunteers would really be appreciated. Interviewer: You have also been involved with World Renew, one of our denominational agencies, and their branch, Disaster Response Services. Paul: We have been out seven times on two- and three-week projects. Interviewer: Where are some of the places you have gone? Jan: First we went to High River in Canada, by Calgary. That was in the summer for two weeks. Then we went to San Marcos, Texas, then Pensacola, Florida, then Tarboro, North Carolina three times. Paul: And we are headed back to Tarboro in March. Interviewer: What kind of work have you done out there? Paul: Most of it is rebuilding houses damaged by floods. Jan: Except for Pensacola – that was tornado damage. Paul: That’s right. There is a lot of mold remediation, dry wall work, and painting. There is some construction – rebuilding. Jan: All of our experiences have been long term recovery except for one time when we went to Tarboro to do rapid response shortly after the hurricane. That was mostly pulling out floors, pulling out wet insulation, and spraying for mold. We piled trash out at the curb and waited for trucks to take it away. Paul: That was for two weeks. We stayed in a church and had to bring our own bedding which is not the usual way. Overall, it’s a really well-run program. It’s well organized, there are adequate tools, plenty of supervision. You don’t need to be a construction expert to do this. Jan: When we were in Tarboro for rapid response, we cleaned out Jimmy’s house. The second time, we were working on Jimmy’s house. And then we were at the ceremony to celebrate the completion of the work. That was really cool, to go from start to finish on the same house. Paul: Seeing the appreciation and satisfaction of the homeowner getting back into a home that they have lost hope on is a remarkable experience. Interviewer: It’s really fun being with the other folks and working together, isn’t it? Paul: It is. We develop a nice camaraderie over the three-week time. 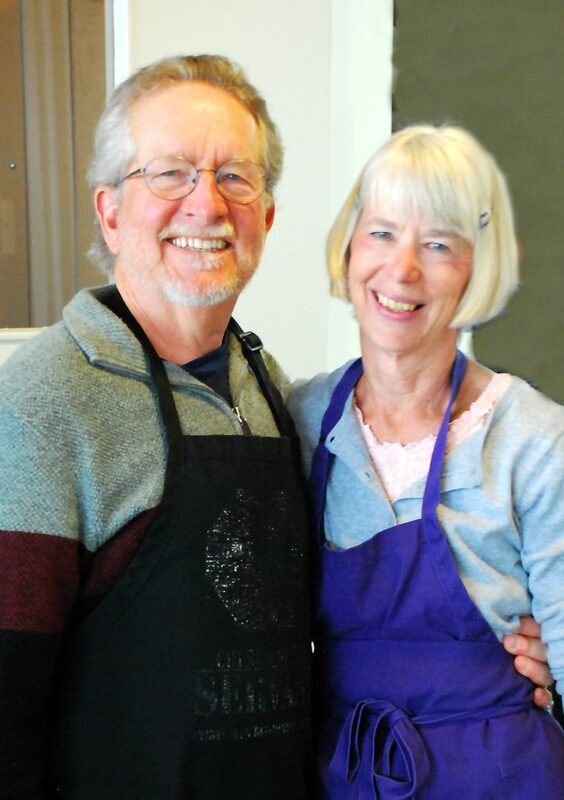 Jan: World Renew provides housing and meals for the volunteers. The living situations vary a bit, but so far, they have all been decent. Interviewer: I understand that DRS has undertaken a new venture, working on a project here in Grand Rapids that you have been involved in. Jan: It’s called Well House. Paul: Well House is a local organization that provides housing for homeless people. Jan: Without religious requirements. They don’t have to go to church or change their life style. Paul: In this particular project Well House is partnering with World Renew in order to rehab an old, dilapidated home in the central city with the idea of providing housing for 4 to 8 homeless people who will then no longer be homeless! It’s a partnership that is just getting off the ground. It has a few kinks in it but it has a pretty good future where DRS can provide the volunteers and Well House can provide the financing and the organization. Interviewer: At this point you have pretty much finished the demolition phase, right? Interviewer: And you are ready to start building. Paul: The next phase is to get professionals in to do the heating, plumbing, and electrical. After that is done, volunteers can once again get busy doing dry wall and painting and trim work. Interviewer: You folks have certainly done some interesting things. Is there anything else you have been involved in that I am not aware of? Jan: I help with office tasks at church. I help count the collections and collate liturgies. Paul: For years I did the church directory. Interviewer: The photography of that? Paul: And the layout and production. I also helped refresh the church branding back in 2012. Interviewer: What did that involve? Paul: We needed to brighten up the logo. Design how signage would look and how the liturgy would be designed. And various design elements of the church’s graphic identity. Jan: We also help with the church garden and yard cleanup twice a year, spring and fall. There is a real need for extra volunteers for those jobs. Interviewer: Well, I just want to tell you how much we appreciate what you two do. Your art work is visible. But a lot of the rest of what you do is behind the scenes. It’s like oil in the gears. It’s what keeps the church running. People don’t see it and don’t notice it till something goes wrong. But it’s awfully important. Jan: Retirement gives us more time to help with these activities that we have done over the years. We would like to encourage others to find the volunteer opportunities at COS that fit their abilities and schedules. Interviewer: Paul and Jan, thank you very much!